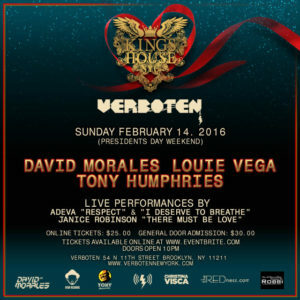 Kings Of House NYC is bringing together three legendary musical icons. David Morales, Tony Humphries and Louie Vega are joining forces for a jamming night that any music fan won’t want to miss. KOH NYC will play a compilation of solo sets along with back to back jam sessions. 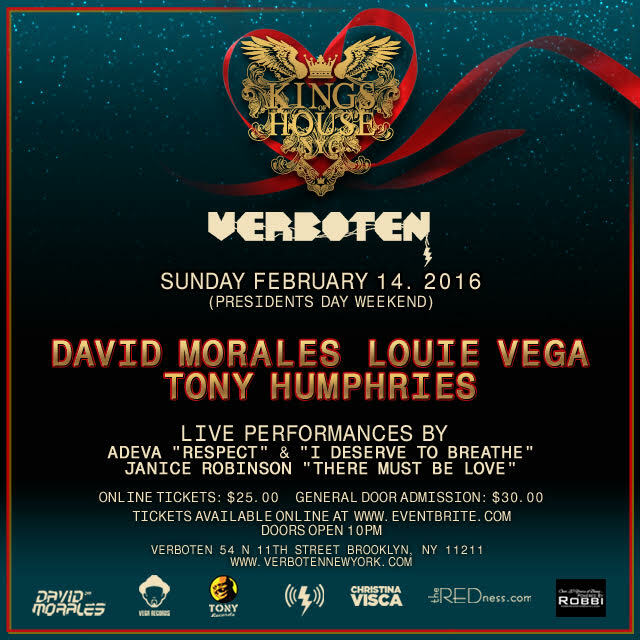 KOH NYC next stop is at Verboten (Williamsburg, Brooklyn) on Sunday, February 14th during Presidents Day weekend. These legends have rocked the floors of NYC, Miami, Los Angeles, London, St. Moritz, to name a few. Come and experience the ultimate musical experience with these 3 legends, live in Brooklyn on Feb.14th, 2016!